Nicole's Needlework: Calgon take me away! Matthew has been so fussy for the past few days. I think he's teething. I hate teething. I hate fussy. I like nice, sweet, babies who take good naps. He has only been taking like one nap a day. I'm ready to pull my hair out! I have to get through this somehow? Somehow! 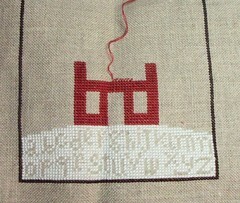 I haven't really gotten any stitching done. I got a little done Saturday at my MIL's house and little today while waiting for ds to get out of school. Prairie Schooler Winter Wind progress as of today. You'll have to excuse the half stitched row, that's all I could finish before Matthew started crying! :) Well, I'm going to have some chocolate and rock the baby some - while taking deep breaths! Write later! I love your PS piece. Matthew is adorable even though he's fussy. I don't miss those days. Poor little guy and poor mommy - I'm not sure I'm missing baby days enough, but this helps, 4 is enough for us I think! Poor Matthew, he does look kind of miserable. He'll feel better soon; hang in there! 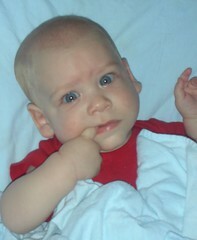 Teething is so rough ~ hang in there. Hey, chocolate is a good comfort!! !